These signs indicate that a particular course of action must be undertaken. Instruct staff and visitors when behaviour or action are prohibited . 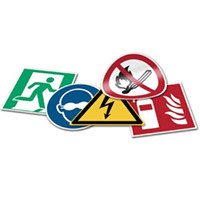 Brady has a wide range of Health and Safety Signs and First Aid Signs with or without text. Photoluminescent Safety Signs for the safety on ships and vessels. Eliminate the consequences and inherent risk of power failure and blackout. Safety Symbol Labels on a roll.